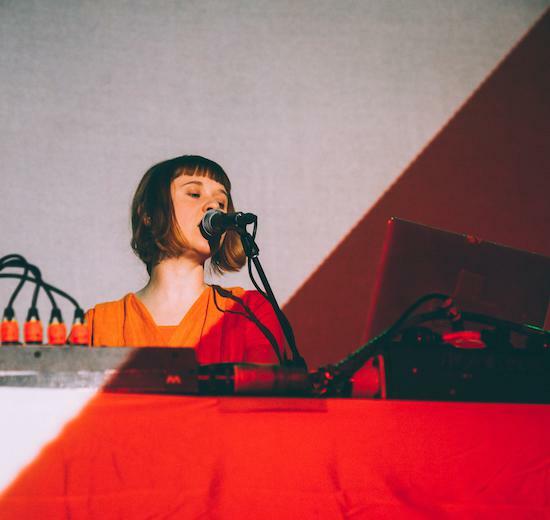 Over three frenetic days of gigs, discourse, sound-art and clubbing, this year’s Unsound Adelaide taught us a thing or two about the future of music. By Lewis Fischer. If there was one thing apparent, in both the discourse and concert series, it was the question (and perhaps answer) of how an electronic artist should perform. The mounting pressure to incorporate a visual or video element into shows has led to some stale practices on the festival circuit (cue: aggressive strobe lighting), but Unsound felt different. Pharmakon (aka Margaret Chardiet) wound her way through the crowd to physically grapple audience members and scream in their faces. In Euclidean Drone, Robin Fox mesmerised his audience with a stream of laser wormholes and audio (the audio, he explained, was generated by and concurrently with the lasers). Witnessing organist and composer Kara-Lis Coverdale required walking into a near lightless room before you could be enveloped by her lush, resonant tones. And, in an in-the-round performance by N.M.O. — featuring a gym towel, push-ups and a bottle of Moët — they proved electronic music can be fun, also (if you pour that Moët out onto the floor, that is). No artist today could be more current than Holly Herndon. Her live visuals incorporate text that is typed and projected live in real-time by partner Mat Dryhurst. Dryhurst also controls a 3D rendered environment, designed by Akihiko Taniguchi, which is filled with floating brown onions, corn, sushi, packet-noodles and people that can be manipulated and ‘played live’. Previously, they’ve cut out people’s faces (people who’ve clicked ‘attending’ on an event page or whom they know will be attending) and placed them into their video. Their intent is to truly be sharing that time and space inside of a performance with someone. Colin Self has recently joined the duo and is now very much part of the family according to Dryhurst. He brings a second vocal to harmonise with Herndon and choreography that lit up the stage at Unsound. Wolf Eyes’ set travelled to a stranger place. It was an especially (and perhaps surprisingly) intimate performance from the Detroit psycho-jazz trio, featuring a dynamic combination of distorted cello, trip-metal sunglasses and a crooning Nate Young scrambling up noise on his modular synthesizer. John Olsen traded between his maracas and dual-wielding as many horn, wind and reed instruments he’d managed to bring into the country. Oren Ambarchi, Chris Abrahams and Rob Avenaim should each in their own right be declared an Australian national treasure. Away from their respective groups and projects, the trio performed an improvised and highly experimental set at Thebarton Theatre. Perched behind a bird’s nest of pedals and patch cables, Ambarchi manipulated his tobacco-burst Les Paul through an Ampeg and a warbling Leslie speaker cabinet. Avenaim, who’s best known for his unorthodox and extended percussion techniques, brought a technical and aesthetic wonder to the performance. Having rigged his drum kit with mechanically triggered implements, drum sticks aimed down on each ride cymbal and programmed kicks, he eventually unravelled into a crescendo of polyrhythms and odd-timed blasts. Abrahams - pianist for jazz group The Necks - inflected wave after wave of colourful arpeggios against Ambarchi’s harmonics and noise. Perhaps the most anticipated performance at Unsound belonged to Errorsmith. In conversation with Robin Fox, Erik Wiegand explained his 13-year absence as a combination of detail-obsession, experimentation and frustration. He told of his sub-atomic approach to sound design and building Razor - a new synthesizer he used to craft his new album, Superlative Fatigue. Despite his scientific approach, Wiegand’s ideas, he said, must come naturally through improvisation. And, with a contact microphone strapped to his throat, Errorsmith announced his return with ‘Lightspeed’ and other tracks off his latest to a dancefloor found ready and eager. In a brief address before opening the first Unsound Adelaide discourse programme, co-director David Sefton celebrated that the festival is now a standalone event enabling them to programme free shows. Sound-art installations, such as the magnificent ‘Mare Balticum - Narva Wall Mix’ by field recordist Chris Watson, were just one of the inclusions at the Adelaide Botanic Gardens. Against the moss, humidity and decomposing plant matter of the Bicentennial Conservatory, Watson’s recordings of marine and avian life, crashing waves and snapping ice were a highlight. The closing night performance of Uwe Schmidt’s Señor Coconut was Unsound’s M Night Shyamalan plot twist: Kraftwerk, The Doors and Eurythmics performed in the style of cha cha cha. A fitting finale to three days of intense, radical programming.